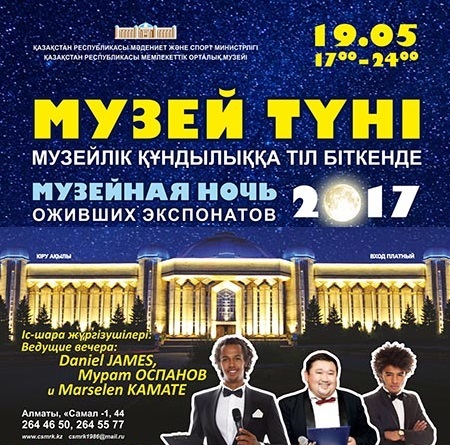 In order to mark 18 May as International Museum Day, the Central State Museum of the Republic of Kazakhstan will hold the 12th "Night at the Museum" project in Almaty, Kazakhstan, on 19 May 2017 from 5:00 pm to 00:00 am. The international project "Night in the Museum" was launched in 1997 (Berlin). Later on the initiative was supported by UNESCO and ICOM (International Council of Museums). In 2006 the Central State Museum of the Republic of Kazakhstan became a member of the project. Over the past 12 years the event has become an attractive and a highly expected event in the cultural life of the Almaty city. The main objective of the annual project is to strengthen museums’ image within the communities through the organization of special events and programmes dedicated to the historical and cultural heritage. This year’s special focus theme will be on "Museums and controversial history: talking about the complex". Every year more than 10,000 people attend the “Night in the Museum” in Almaty. This event gives a powerful impetus to the popularization of museums, crafts development and quality improvement of goods and services in the sphere of culture. On this night museum will open its repositories and give visitors an opportunity to enjoy the rare collections and to develop their creative skills through the proposed workshops on Kazakh sport games (asyk), traditional forms of crafts and production of the wooden toys and souvenirs. Kids will be offered interactive shows and workshops (aqua makeup, animators, production of caramel, painting of decorative figures, variety). Each visitor, who will post information about the event "Night at the Museum" in the social network (with 5 or more photos) with a hashtag #Ночьвмузее2017ЦГМРК, #ҚРМОММузейтүні2017, #NightMuseum2017CSMRK will receive a special gift from the Museum.